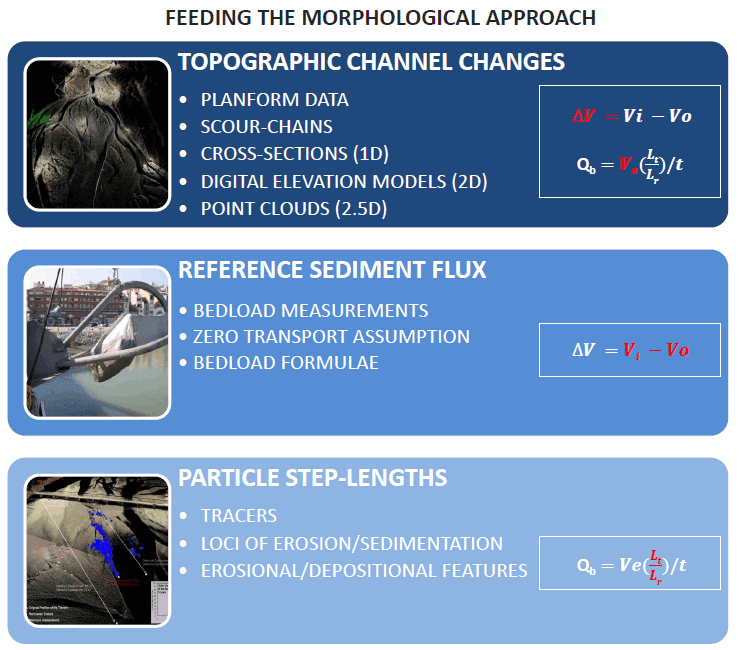 The morphological approach is a technique of calculating sediment flux from changes in topography. By contrast, a morphological sediment budget is a statement of the conservation of mass - a fancy way of saying that the change in storage (i.e. the stuff from our DoD change detection) is equal to what came in to our area of interest minus what left our area of interest. In this lecture, we will learn about the challenges in closing sediment budgets (i.e. quantifying all three terms and seeing if they add up correctly), and share with us her doctoral research on this topic. One of the most common applications of geomorphic change detection is quantifying a morphological sediment budget. However, the 'net' change in storage is one of the most potentially uncertain terms that comes out of geomorphic change detection. By contrast, the morphological approach only relies on the erosion terms from geomorphic change detection, which are typically those we have the most confidence in. Figure from Vericat et al. (In Review). Brewer, P.A. and Passmore, D.G., 2002. Sediment budgeting techniques in gravel bed rivers. In: Jones S and L. Frostick (Editors), In Sediment Flux to Basins: Causes, Controls and Consequences, Special Publication 191. Geological Society, London, pp. 97-113. Erwin, SO, Schmidt, JC, Wheaton, JM and Wilcock, PR. 2012. Closing a sediment budget for a reconfigured reach of the Provo River, Utah, United States. Water Resources Research. 48: WR10512. DOI: 10.1029/2011WR011035. 2002. Lindsay JB and Ashmore PE. The effects of survey frequency on estimates of scour and fill in a braided river model. Earth Surface Processes and Landforms. 27(1): 27-43. DOI: 10.1002/esp.282. In Review. Vericat D, Wheaton JM and Brasington JA. Re-defining the morphological approach with repeat high resolution topography. Invited submission for edited volume for Gravel Bed Rivers 8.